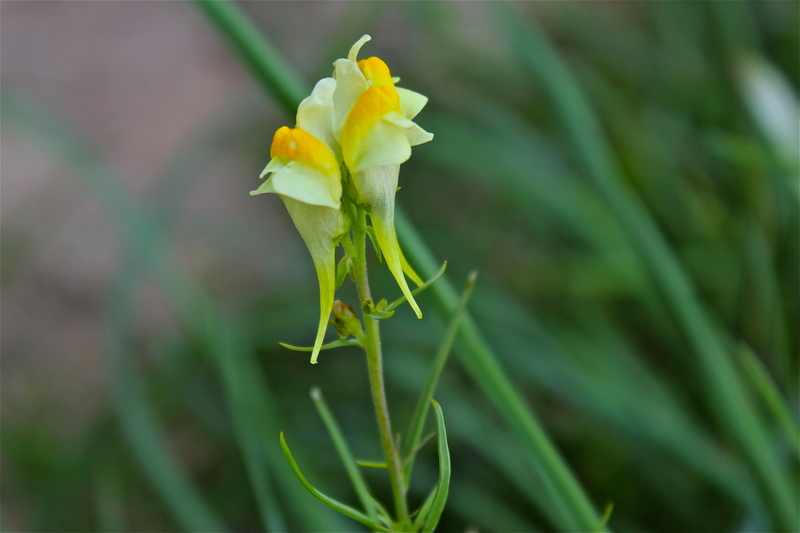 This plant has many common names, including Common Toadflax, Wild Snapdragon, Yellow Toadflax, and of course, Butter-and-Eggs. Another “introduced” wildflower, it is native to Asia and Europe, but it is now a naturalized weed present in all of North America. Butter-and-Eggs is a perennial plant with erect stems and thin, threadlike leaves that are bluish-green in color. The distinctive flower has an upper lip that is pale yellow and a lower lip that is darker orange-yellow like the yolk of an egg. The “snapdragon” shape of the flower requires large pollinators who can open the “mouth” of the flower and crawl inside. Young children enjoy playing with these flowers because they “snap” on your fingers if you prod them a little bit. Butter-and-Eggs has been used as an herbal remedy for a variety of medical complaints. Tea made from the leaves has been deemed effective as a laxative and a diuretic. As a side note, Butter-and-Eggs is a long-lasting cut flower that always brightens an arrangement! Look for them starting in early summer–they bloom until fall.